On December 5, The Hindu, a major national daily, reported an important step forward in Indian Muslim relations with state governments. According to the newspaper, authorities in Rajasthan, on India's western frontier with Pakistan, have appointed representatives of the Barelvi sect, a traditionalist Sunni interpretation imbued with spiritual Sufism, to the leadership of several Muslim institutions. In doing so, The Hindu reports, Rajasthan effectively barred radical Islamist agitators from directing local communal bodies, and has followed the lead of the central government, which is controlled by the Indian National Congress-led United Progressive Alliance. A prominent Barelvi, Maulana Fazl-e-Haq, who is affiliated with the Madrasa Ishaqiya of Jodhpur, will head the state's Madrasa Board, with responsibility for administration of Islamic religious education. He is a disciple of the aged Sufi Hazrat Allama Pirzada Maulana Chaman Qadri. Hazrat Chaman Qadri, of Gyarwee Sharif Jalsa Bundi, is a leading figure in the Qadiri Sufi order (tariqat), one of the largest and oldest in the Muslim world. Chaman Qadri is also the chief qazi (head Islamic judge) in Rajasthan and a member of the Hajj Committee and other Muslim institutions. The Rajasthan Urdu Akademi, charged with development of Urdu culture among the state's Muslims, will be supervised by Habib-ur-Rehman Niyazi, from the Barelvi family of Meerji Ka Bagh. The Rajasthan Public Service Commission will now include Indian Police Service officer Habib Khan, a Barelvi. The new chairman of the State Minorities Commission, M. Mahir Azad, is known as a Sufi sympathizer. Previously, Rajasthan had appointed Liaqat Ali, a devotee of a Sufi shrine in the district of Jhunjhunu, to the local Waqf Board, with oversight over Islamic pious foundations. In the analysis of The Hindu, Rajasthan's Muslim apparatus will not encompass representatives of Darul Uloom Deoband, the fundamentalist seminary in Uttar Pradesh (U.P.) disseminating the doctrines that inspire the Pakistani and Afghan Taliban. Deobandism, imitating the intolerant habits of Saudi Wahhabism, declares Barelvism to be kufr ("disbelief" – literally, "concealment of the truth of religion"), and Deobandis seek to render Barelvis vulnerable to murder and pillage. Deobandis are aligned with the jihadist Jamaat-e-Islami (JEI) movement founded by Abu'l Ala Mawdudi, and Deobandism produced the worldwide Islamist missionary organization, Tabligh-i-Jamaat (TJ). Darul Uloom Deoband has invited to India such representatives of the Saudi Wahhabi sect as Abdur-Rahman Al-Sudais, Friday preacher and imam at the Grand Mosque (Haram) in Mecca. Al-Sudais, who is banned from entering Canada because of his hateful diatribes, visited Darul Uloom Deoband and New Delhi in March 2011. The Rajasthan state government's naming of Barelvis to Muslim community positions is described by The Hindu as reflecting "an atmosphere building up all over [India]" against Wahhabi extremism, Deobandi influence, and the penetration of their advocates in Muslim institutions. The All-India Muslim Personal Law Board (AIMPLB) has been a particular arena for conflict over Wahhabi and Deobandi intrigues. All-India Ulema and Mashaikh Board (AIUMB) general secretary Syed Mohammad Ashraf Sahab Kichowchhwi, head of the Sufi shrine of Kachhochha Sharif, in Faizabad. A frontline role in opposing Wahhabi and Deobandi growth among Indian Muslims has been taken by the All-India Ulema and Mashaikh Board (AIUMB) and its general secretary, Syed Mohammad Ashraf Sahab Kichowchhwi, head of the Sufi shrine of Kachhochha Sharif, in Faizabad, U.P. AIUMB claims to represent 80 percent of Indian Muslims, and has called for cooperation between Sunnis and Shias in the Islamic fold. Maulana Kichowchhwi and AIUMB have organized an extensive campaign to expose and condemn Wahhabi and Deobandi fanaticism and the danger it poses to Indian Muslims, the whole country, and all of humanity. In 2010, Kichowchhwi and the AIUMB demanded that Muslims "liberate" 10,000 mosques, madrasas, shrines, and other Islamic institutions in U.P. from Wahhabi-Deobandi control. In October 2011, AIUMB called a mahapanchayat with the participation of 100,000 Muslims in Moradabad, U.P. that underscored the board's repudiation of radicalism. In November 2011, Darul Uloom Deoband issued a fatwa condemning all celebration of birthdays as a Western and un-Islamic custom, as reported in The Hindu of November 10 by Vidya Subrahmaniam. Darul Uloom Vice-Chancellor Abul Qasim Naumani emphasized that the seminary does not honor the Prophet Muhammad's birth, or milad-an-nabi – a practice hated by Wahhabis. Muhammad's birthday is an official holiday in 54 Muslim countries – but not in Saudi Arabia, where it may be celebrated only in private. It is a recognized national holiday in India, Sri Lanka, Fiji, Guyana, Kenya, Tanzania, and other states with significant Muslim minorities. By defining such observance as un-Islamic, Deobandis would expel the Barelvis, as well as hundreds of millions of Muslims around the world, from the global Muslim community or ummah, targeting them as alleged "apostates." Maulana Kichowchhwi responded to the Deobandi fatwa prohibiting milad-an-nabi by announcing, "The fatwa is proof that Deoband would like to impose the foreign ideology of Saudi Arabia and Wahhabism on India." He cited classic Islamic scholars' evidence that Muhammad celebrated his own birthday. According to Kichowchhwi, Indian Muslims always participated in "Julus-e-Mohammadi" commemorations of the Prophet's birthday. Deobandi representatives have assailed Rajasthan chief minister Ashok Gehlot and the Congress party for favoring the Barelvis and Sufis. The Rajasthan Muslim Forum, a Deobandi group, alleged that the Rajasthan government seeks to create "sectarian discord" among Muslims, supposedly to conceal the involvement of Congress in communal violence between Muslims and non-Muslims. M. Salim Engineer, national secretary of Jamaat-e-Islami Hind (JEIH), the Indian branch of the Mawdudist JEI, argued that a majority of madrasas in Rajasthan incorporate the Deobandi curriculum. But there as in U.P., the Barelvi representatives say that Islamic schools have been usurped by the radicals. AIUMB has taken its message to Indian Muslims outside U.P. On November 20, AIUMB national secretary Syed Babar Ashraf met with other Sunni Sufi leaders to address a peace conference in Murshidabad, West Bengal, attended by 1,000 Islamic scholars and an audience in the tens of thousands. He was joined by Shahnawas Warsi, national secretary of the Muslim Students Organization of India (MSO); Allama Ziaul Mustafa Qadri of the All-India Sunni Jamiatul Ulema, a Barelvi group; Maulana Shoaib Raza, from Bareilly Shareef in U.P., and Ghulam Samdani Razvi, Grand Mufti of West Bengal. Bareilly Shareef was the birthplace of Ahmed Raza Khan Fazil-e-Barelvi (1856-1921), the main theological figure in Barelvi Islam, and is the location of his shrine. 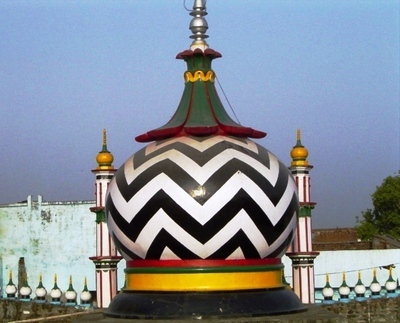 Dargah of Hazrat Ahmed Raza Khan, Bareilly Shareef -- Photograph 2004 Via Wikimedia Commons. MSO's Murshidabad convocation, according to the U.S.-based Indian Muslim news portal TwoCircles.net, endorsed the disapproval of the AIUMB, with which MSO is aligned, regarding the financing of Indian Muslim institutions by Saudi Wahhabis. It appealed for the establishment of a central madrasa board to monitor foreign funding of religious schools; high-quality, modern schools in districts with large minority populations; removal of extremists from waqf administration, and the adoption of legislation governing Sufi shrines (dargahs) to protect and operate them according to moderate Sunni principles. On November 27, in Bareilly Shareef, as described by Times News Network (TNN) writer Manya Gugliani, 250,000 Muslims heard Maulana Kichowchhwi and other AIUMB leaders similarly denounce Wahhabism and defend Sufi tolerance in Indian Islam. At Bareilly's Islamia Inter College, Kichowchhwi reiterated the need for the central government to establish a central madrasa board that would audit the flow of Saudi funds to Islamic schools in India. AIUMB national secretary Syed Babar Ashraf warned, "Right now the madrasas are under the control of Wahhabi-inspired organizations which run on Saudi money. The ideology they teach and spread is hardline Wahhabism." Kichowchhwi extended his criticism of Saudi Wahhabism and South Asian Deobandism to include "Salafis," who use this title, referring to emulators of the first three generations of Muslims including Muhammad, his Companions, and his Successors, to camouflage their adherence to Wahhabi doctrines. He additionally reproached "Ahle-Hadith," another term employed in South Asia to cover Wahhabi intentions. Maulana called specifically on the Indian central government to prevent the assumption by any representative of these trends of duties as a chairman, chief executive officer, member or manager of any waqf in India. "They are utilizing Waqf properties to propagate Wahhabism, which preaches hate and intolerance and now has become a threat to the country's secular fabric," he said. Other speakers at the Bareilly event stressed, as elements of the inclusive character of Sufism, their pledge to Muslim unity and their perseverance in the Sufi custom of inviting non-Muslims to pray in their shrines. The Bareilly meeting was held on the third anniversary of the massive terrorist attack in Mumbai, which is believed to have been coordinated by the Kashmir-centered Lashkar-e-Taiba (LeT) with the complicity of the Pakistani authorities. As described by Rakhi Chakrabarty on TNN, Maulana Kichowchhwi used the occasion to affirm that the accused in the Mumbai massacre "must be given harshest punishment as per the law so that it serves as a deterrent. It should send a strong message to terrorists that our law is not weak." 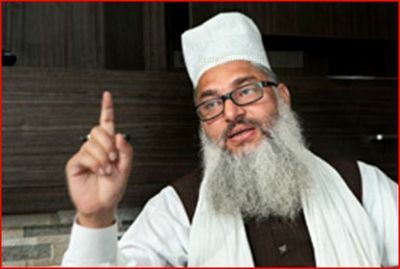 While Deobandi representatives accuse the Indian central government of using the Barelvis as a counter to Deobandism, AIUMB officials do not profess false modesty – rather, they see the consequential action in Rajasthan state as a product of AIUMB's committed defiance of Wahhabi corruption and Deobandi extremism. If the Indian central government has decided to assist the Barelvis in shaking the Wahhabis, Deobandis, "Salafis," "Ahle-Hadith" and other extreme fundamentalists out of Indian Muslim community institutions, that is a cause for congratulation, not complaint, to India's political class. In the aftermath of the upheavals of the "Arab Spring," movements for civil society and secular governance in the North African countries have been pushed aside by the Muslim Brotherhood, which allied historically with the Saudi Wahhabis and South Asian Mawdudists, and which triumphed in the recent Tunisian, Moroccan, and Egyptian elections. Further, in a particularly alarming development, a mass Wahhabi formation (using, as elsewhere, the false "Salafi" label), the "Party of the Light" or "Hizb Al-Nur," received 25 percent of votes in the first round of Egypt's polling. A similar, if not worse, outcome is expected from the second round of Egyptian balloting, which was held on December 14-15 amid violent protests against the rule of the Supreme Council of the Armed Forces (SCAF). Its results have yet to be released. The "Arab Spring," with its early, liberalizing idiom, was expected to strengthen civil society in the Arab Muslim lands, and was greeted with considerable enthusiasm by moderate Muslims as well as by Western partisans of democratic change. The effect of free electoral choice in North Africa has so far been very different, to say nothing of the chaos in Yemen, cold stalemate between Sunni rulers (backed by Saudi Arabia and the Gulf Cooperation Council) and the Shia majority in Bahrain, and continuing hideous massacres by the Al-Assad regime in Syria. The "Arab Spring" was believed to herald the end of the cycle of radical Islamist gains that began with the Iranian Islamic Revolution in 1979, and which, outside the Middle East, has devastated Pakistan. Significant obstruction to Wahhabi aggression now appears in the peripheral Muslim communities, including the Balkans no less than India. Calling itself "the world's largest democracy" and possessing the third largest Muslim population in the world, India has produced a stiffer resistance to radicalism than any of the lands of the "Arab Spring." If Egypt and Syria are bulwarks of extremism and tyranny, Indian Islam may provide a barrier to jihadist ambitions. With their widely-respected intellectual heritage, their close link with spiritual Sufism, and their demonstrated loyalty to India, the country's Muslims have shown the world that Western governments are wrong to accommodate radical Islam. Now we hear in the U.S. and Britain, from government in the first instance and media commentators in the second, that the Muslim Brotherhood is "moderate" in its program and that the so-called "Salafis" in Egypt are merely "conservative." Ordinary Muslims from the Balkans to Bengal have expressed their disagreement with this benign view. India need not repeat a mistaken strategy of accommodation to the Wahhabis and their disciples. Maulana Kichowchhwi and the AIUMB deserve the strong backing of India's moderates and non-violent religious conservatives, Muslim and non-Muslim, in confronting the encroachments of Islamist zealotry. The effect of religious and political hindrance to the Wahhabi "revival" will be felt throughout the large Indian Muslim diaspora, and its example may be seen and equaled by other Muslim communities, as well as Muslim and non-Muslim governments. The decision of the Rajasthan state government, which, on the Pakistan border, faces a risk greater than in U.P. or West Bengal, is especially important. A struggle that may have been lost in Egypt and Pakistan may be won in India. And as India's Muslims go, so may the entire ummah develop in its relations with secular governance.